1981 began the year with the new revolution in the world of action figures. The standard size of figures were 3 3/4 inches, until Mattel changed it all with the introduction of the greatest action figure line of the Eighties. He-Man and the Masters of the Universe. The figures now stood at 5 1/2 inches. This height increase gave creators room to add more detail and sculpting. The figure line was hatched from the idea of mixing the fantasy world of magic, with the world of technology. The result: strong muscular warriors with high-tech weapons and accessories. Mattel created 72 different figures in all, with some very well known variations. Every figure came with some type of accessory, whether it be a sword,laser, shield or some offshoot of a weapon. The first series, released in 1981, featured two of the most popular of the series He-man and his evil nemesis Skeletor. In fact these two figures were modified with different accessories and introduced in almost everyone of the next series obviously due to their popularity. The first series consisted of 8 figures all placed on what is called the "8 back card". Using the Star Wars method of advertising new figures, the newest figures added to the line would be placed on the back of the cards so kids could know what to hunt for on their trips to the toy store. These "8 backs" are very difficult to obtain and command a very high price. Mattel continued to add more and more figures to the series, until its demise in the late eighties. 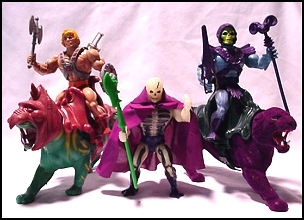 With each new figure line-up, gigantic playsets and impressive vehicles were also added, including what many feel is the greatest accessory made for action figures: Eternia. Eternia was a castle playset matched by no other, even by todays standards. It stood over 3 feet tall and 4 feet wide, with the ability to connect to the Greyskull and Snake Mountain playsets. A childs dream. The last set of figures or "tail enders", were some of the most difficult to obtain. They included King Randor ( He-man's father), The Sorceress, Ninjor and the one representing pure evil: Scareglow. A handful of different figures turned up in the foreign markets like Laser-light Skeletor, Laser-light He-Man, and two giant figures, Megator and Tytus. All four are very hard to obtain from the U.S. Many variations and production changes have been documented over the years by collectors. One of the more famous variants are the Stratos with red wings, and the Stratos with blue wings. Others common variations included a Black skinned Grizzlor, a Rattlor with a red neck (as opposed to yellow), and Merman with a green belt. Then there are the very rare variations which include : Scareglow with a glowing staff (as opposed to the common green), Man-e-faces with the additional five maroon weapons, and Beastman with a green whip. These are all childs-play to obtain compared to the rarest of all figures in the He-Man collection. In 1982 Mattel teamed up with Wonderbread to offer a mail-away He-Man figure. With the line being relativly new, not many of these figures were actually mailed out to respondants. This would have been okay, with the minor exception that it had Dark brown hair, black belt, dark brown shorts, dark brown boots and a brown axe. A completely different figure. Due to the lack of ordering, today this very hard-to-find He-Man figure commands $300 plus dollars on the secondary market for a mint complete specimen.